Product Description: A high quality latex vehicle pigmented to produce a high hiding eggshell finish. 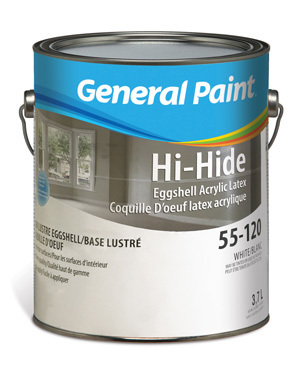 Intended Uses: A quick drying hi-hide eggshell latex finish for interior use on drywall and other prepared surfaces. Provides a durable finish for architectural service in hallways, living and dining rooms, and other areas where a flat finish would be difficult to maintain. Not suitable where excess moisture occurs (e.g., bathrooms). Ideally suited for new construction to achieve a two coat finish on new drywall. Has spatter free application properties.